The key to understanding Putin is to recognise how he uses information to tell him who we think he is. But what does that tell us? German Chancellor Angela Merkel famously said that President Vladimir Putin lives 'in another world.' Putin was delusional, out of touch with reality, and perhaps even crazy. Some observers have since argued that Putin believes his own propaganda. But to think that Putin is delusional or even crazy is more a projection of our assumptions, our fears and our world onto Putin. In fact, argue Fiona Hill and Clifford Gaddy in their newly-expanded portrait Mr. Putin: Operative in the Kremlin, Putin sees the world fundamentally different than his American and European counterparts. Putin’s world is a combination of the lineages of Russian history and culture, and his personal experiences, and the contexts that have shaped them. These provide the circumstances for Putin’s motivations and actions. Figuring out what drives Putin to act the way he does is essential, Hill and Gaddy insist, because to not do so will lead to gross miscalculations on how to confront him. Who is Vladimir Putin? It is a question often posed, perhaps too often, in numerous books and articles. Uncovering the Putin mystery has become more acute since the crisis in Ukraine, when to many, Putin has become erratic, unpredictable, and dangerous. There are enough Putin books to form their own academic niche, Putinology. In most of these texts, Putin always plays the villain, a vile, corrupt, and power-hungry figure who seeks to expand and maintain his singular grip on power, to restore the Russian empire and even the Soviet Union. In these renditions, Putin appears as a caricature of a super villain, an image, one suspects, Putin secretly enjoys. Putin appears as a caricature of a super villain, an image, one suspects, Putin secretly enjoys. Mr. Putin fits uneasily within this canon. Putin is the singular focus, and his life, world view, and actions epitomise the system as a whole. What is refreshing about the narrative is that it lacks the gory details of the ‘Putin regime.’ Moral pontifications and condemnations are absent. Also missing are retellings of already well-worn information about the various conspiracies involving Putin and other drumbeats of authoritarianism. Other Putin biographers have done this service. In addition, many of these episodes in the Putin narrative speak more to our concerns than uncovering Putin’s motivations. When Hill and Gaddy address scandals involving Putin, like the infamous food scandal in St Petersburg in 1992, they try to figure out what Putin learned from these events, and how they influenced his future perceptions and actions. It’s an invitation into Putin’s world. Still, Putin is a hard nut to crack hence all the speculation about his biography. The information we have about his early life, time in the KGB, as an agent in Dresden, Germany, his days in St Petersburg in the 1990s, and his improbable, yet quick, rise to power, has been tightly packaged. As are his personal habits, public appearances, and publicity stunts. Putin and his team are masters of the image successfully turning the brand Vladimir Putin into a construct where the spectator fills the content. Putin can be anyone and no one: a KGB agent, a free marketeer, a populist, a nationalist, a muzhik [regular guy], and never really be any of these. To pin Putin with one identity only evokes a slew of contradictory identities. Hill and Gaddy liken him to the British cartoon favourite Mr Benn who dons one character after another or as Masha Gessen titled her anti-Putin screed, he’s the man without a face. Yet these are the texts biographers have to work with, replete with their many narratives and meta-narratives. To make matters even more difficult, much of the Putinist texts are not constructed to represent the truth or reality. They are packaged to illicit a response with which Putin analyses and judges. The key to understanding Putin is to recognise how he uses information to tell him who we think he is and how that communicates who we are, what we want, and what our interests are. For Putin, the goal is to not to represent himself, but to be represented. Putin is the 'ultimate international political performance artist.' I would call him the ultimate postmodernist. The key to understanding Putin is to recognise how he uses information to tell him who we think he is. This is why telling a linear narrative to uncover Putin’s world doesn’t work. There are just too many contradictions, too many layers. Still Hill and Gaddy manage to whittle Putin down to six: the Statist, the History Man, the Survivalist, the Outsider, the Free Marketeer, and the Case Officer. Putin has tapped all six identities throughout his political career to much effect. Their exploration makes up the first half of the book. These identities are not a psychological profile of Putin. They are composites based on personal experience, historical context, and circumstances that provide the content of Putin’s world. Among these identities are the Statist, the History Man, the Case Officer, and the Survivalist are the most important. The first, the Statist, provides Putin with his primary goal: to restore a strong state and great power status to Russia, aims he articulated in his Millennium Message in December 1999. In it, Putin fashions himself as a man of the state, a gosudarstvennik, not unlike Peter the Great, Catherine II, Nicholas I, Piotr Stolypin, and Stalin. In fact, these figures from Russia’s past furnish Putin with an arsenal of historical narratives, which as the History Man, he manipulates to shore up the legitimacy for the system. If history gives Putin the narratological tools, his Case Officer persona supplies the methods to fulfill his goals. Putin’s KGB training gave him the important skills for working with people and information to analyse, judge, and deploy as a means to convince, co-opt, or coerce his opponents. And lastly, the Survivalist, which imparts to Putin the importance of strategic planning and the will to fight, and fight dirty if need be, to fulfill his goals. When aggregated together, these aspects of Putin’s being become the elements of the political system he’s erected over the last fifteen years. Putin would like his Russia to function more like a corporation where he sits as the CEO and the lower management work on automatic control. In many ways Putin seeks to transform Russia into the ever-elusive Rechtsstaat, or legal state, where the system functions according to formal laws and procedures. But the informal nature of the system belies this as Putin stands at the centre of an informal network of orbiting elites whose power and wealth are directly connected to their proximity to him. The centralisation of power and decision making into Putin’s hands (what Hill and Gaddy call the 'one boy network') has stymied his ability to delegate. So even though Putin would like to avoid micromanaging Russia (i.e. rule through manual control) he’s often forced to because no one but the gosudarstvennik is willing to make any independent decisions or take responsibility. Despite the centuries-old efforts to modernise, streamline, and systematise the Russian state system, how Russia is actually ruled remains mired in traditions that stretch back to the seventeenth century. The second half of the book covers the 2011/2012 protests up to the present crisis in Ukraine, and focuses on how Putin has deployed his six identities in dealing with domestic crisis and international affairs. Hill and Gaddy’s main concern here is to provide materials on how Western leaders, diplomats and policy makers should understand Putin. To do this, they invite us to see the world through Putin’s eyes. What is Putin’s world? It’s not our world about which he understands very little. What is Putin’s world? It’s not our world about which he understands very little. Putin’s contact with the West and its institutions has been limited. His window to the West was East Germany, in the outpost of Dresden. The rest of his contacts with Westerners were on an individual level during his time in St Petersburg or since in diplomatic settings. Putin has shown disinterest toward European and American culture and has avoided face to face encounters with its citizens. His distaste for the Western world makes it easy for him to dismiss it as decadent, immoral, and in decay. It is hardly surprising that he has failed to come to terms with his own country increasingly becoming Western with Russian characteristics. But his aversion toward the West has also been fortified by the West’s own duplicity. When Putin surveys Western actions, particularly those of the United States, it is not hard to spot hypocrisy, not to mention the trail of destruction. He sees America’s mission to spread democracy as a thinly veiled cover for its geopolitical interests. Moreover, he views himself and Russia as a target of these interests. This is the lens through which he assessed the 2011/2012 street protests aginst him, and the revolution in Ukraine. When Putin says that Russian protesters are funded by the US State Department or that the Ukrainian army is a NATO legion, he means it. Putin, the Statist and Survivalist, considers Russia’s sovereignty as paramount. He puts on his Case Officer hat and imposes his world on ours—that everything is a covert operation where people and information are manipulated to achieve, in this instance, geopolitical goals. Putin then becomes the History Man and places Western actions into a history of past attempts to hobble or destroy Russia. In Putin’s world, he is not the aggressor, but the victim. In Putin’s world, he is not the aggressor, but the victim. If Russia is a Western target, Putin reasons, then Russia needs to fight back using whatever tools are at its disposal. It requires the reaffirmation of principles laid down in his Millennium Message: a strong state, a belief in Russia as a great power, a unified society, and a strengthening of Russian values. The fight also necessitates the adoption of new techniques of waging war, like the hybrid warfare articulated by Chief of General Staff Valery Gerasimov. All of this helps Putin, the Case Officer, to better prod for weaknesses in the West, keep it off guard, confused, and off balance. The 2008 Georgian War was one such prodding, and the annexation of Crimea a test. But the conflict in Ukraine is the real war to counteract perceived Western aggression. Ultimately, Putin wants a new Yalta Agreement where the great powers recognise spheres of influence and a balance of global power where Russia is a key player whose interests are respected. ‘Russia,’ Putin said in his speech marking Crimea’s annexation, ‘has, just like other states, national interests, which must be taken into consideration and respected.’ Whether or not Putin can force the West to take heed remains to be seen. Hill and Gaddy warn against underestimating Putin. He needs to be taken seriously. He is a fighter and a survivalist, and a grand strategist who sizes up his opponents for weaknesses. It is unlikely Putin will throw in the towel. If Hill and Gaddy are right, and they present a compelling case, we can expect the confrontation between the West and Russia to last a long time. 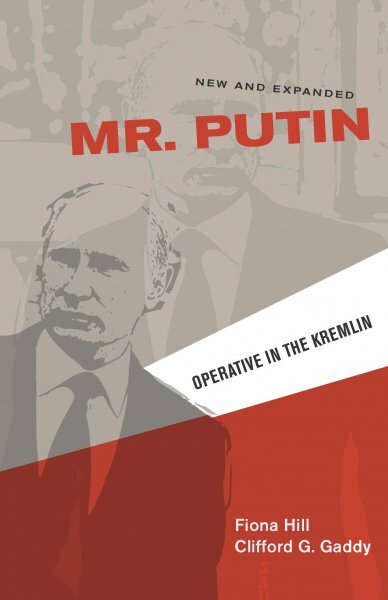 Mr. Putin: Operative in the Kremlin (New and Expanded edition) is published by Brookings Institution Press on 2 February. Standfirst image: cover for Mr Putin (New and Expanded) Operative in the Kremlin via Brookings Insitiution Press.